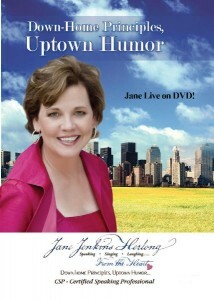 If you just can’t get enough of Jane, then you need to get your hands on this DVD! Your cheeks will hurt from laughing as you watch some of Jane’s best performances featuring her delightful blend of comic relief and folksy wisdom. You’ll even be treated to a few songs by this award-winning recording artist! Whether you watch it with your employees or even with your family, this is one DVD that everyone can enjoy.